At our January 28 meeting, Kat Eggleston & John Daly introduced us to "Salmon Tails Up the Water." Kat described it as another top tune at celtic music session gigs. Hunting it on YouTube, I found some really rocked-out versions, and it seems to be a fav at contra dances, too. So once we get the tempo up to dance-speed, we should have as much fun with this tune as we do with "Morrison's" or any other jig. Here's a very shaky but rip-roaring version from a gang of youngsters calling themselves "OysterBand" who are rocking the Tønder Festival audience in Winnipeg, Canada. Catch the frontman fiddler in the deep back. 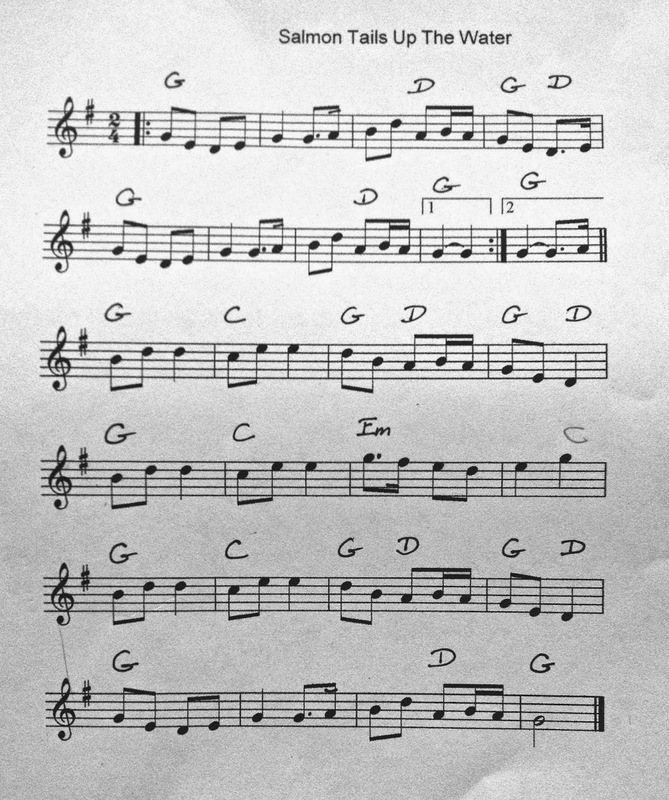 And here's the sheet music, should you need it. The beat is on the 1 & 3.